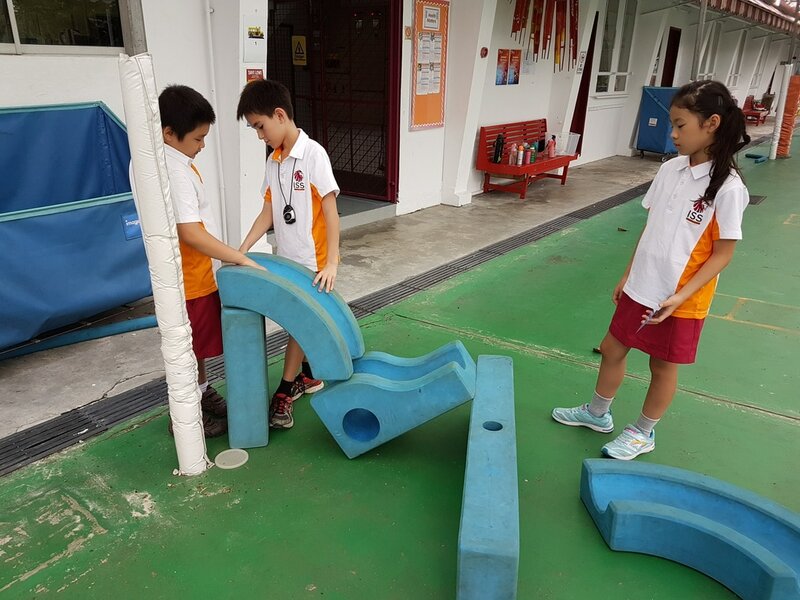 In this work we made a practice marble run which had to be as slow as possible. 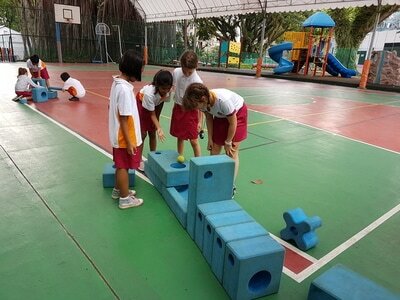 To make the practice marble run we had to get in groups in my group was Kaya,Camille,Nhi and Adra. First we got all the things we needed to make the practice marble run we made our practice marble run in the playground.Our team worked well together because we listened to each other. 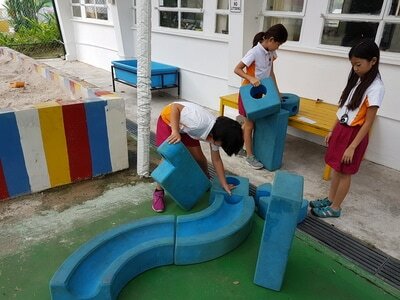 Our practice marble run took 10 seconds. We've been collecting ​toilet rolls, cardboard, plastic bottles because we need equipment to build our marble run. The challenge was building it and making it run for 10 seconds. 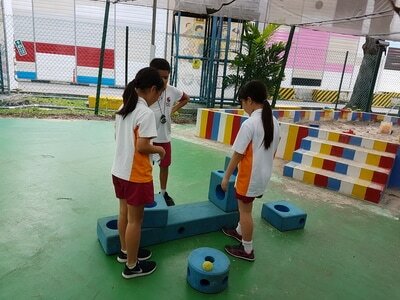 It was really difficult because we needed to test it each time we made a section. 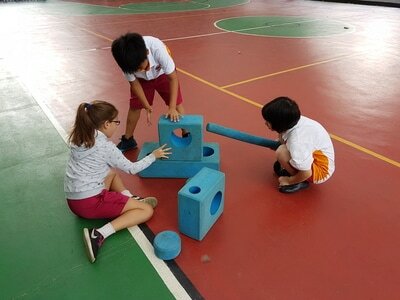 The forces we included were friction, push and gravity. We stopped on our second layer at the end of our lesson. We connected ideas that we learned over the years and added it together we also talked for ideas. We have been working good together because we listened to each other and resolved our conflict. We went to the camp! We have done making the kite, building sand castle, racing, BBQ and some games. Of course, foods were great! I was excited about camp because I can sleep with my friends but some people were nervous because they were afraid of staying away from their family. We became more responsible. We had a lot of fun! In unit of inquiry we have been taking action... this unit we are talking about how the resources has affected people's lives we've done about how has the water affected peoples live. So now we are thinking about how has the food affected people's lives! We've been talking about how much food has been wasted in our school. We plan about how to make people stop wasting food. Food is not good for throw the food and money. So we have been measuring wasted food,making slideshows,making blessing boxes and making posters. Blessing box is a box that keeps food people get things from blessing box when they need it. Money is important because money is to buy staff and food. when you are throw food. We have been working very hard to do those four things. Over the last couple of weeks, our class has worked extremely hard at preparing their own script for our class assembly! They got into groups and came up with their lines which we then reviewed as a class. They also created their own stage directions and actions. I am so proud of all the effort these 8 and 9 year olds have put into this, particularly because they did it all by themselves! 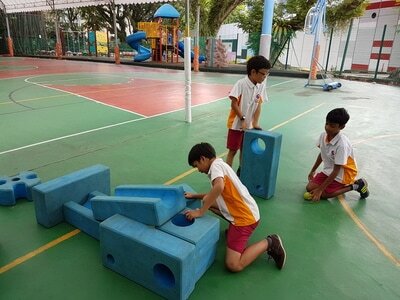 They have shown commitment, enthusiasm and cooperation throughout the whole process. Some of them have been risk-takers and very open minded ones at that, as being on the stage is not something that comes naturally to all. Enjoy their performance below! 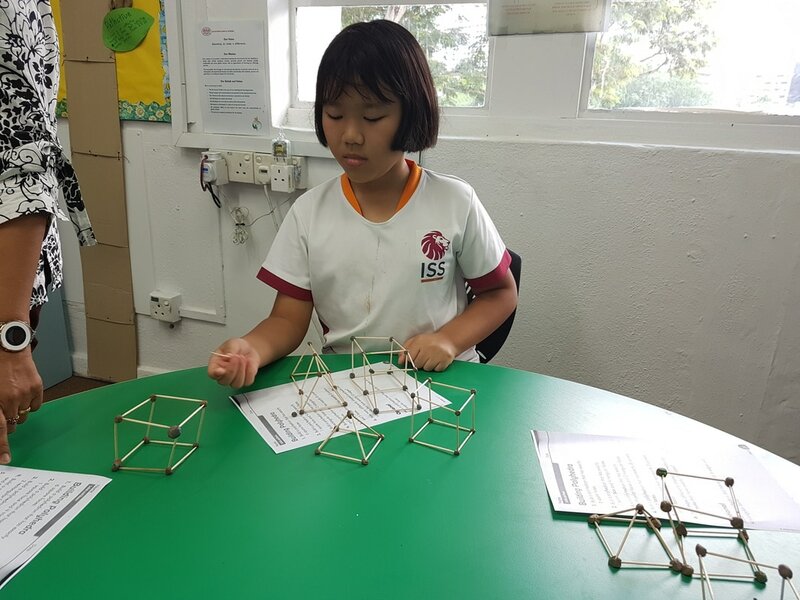 We tried to learn new methods using the links Miss Amin gave us. At first I tried doing long multiplication but it was too hard for me so instead I did the grid method. It worked! I had to watch the video a few times to memorise it too. I soon solved new questions on the board to prove that I could do the method. After that we needed to make a video on explain everything. I did't want to talk to loud on the video because I felt shy but I did it anyway. Here's the video I recorded! This week we have been continuing to self teach ourselves a multiplication method that we chose to learn. 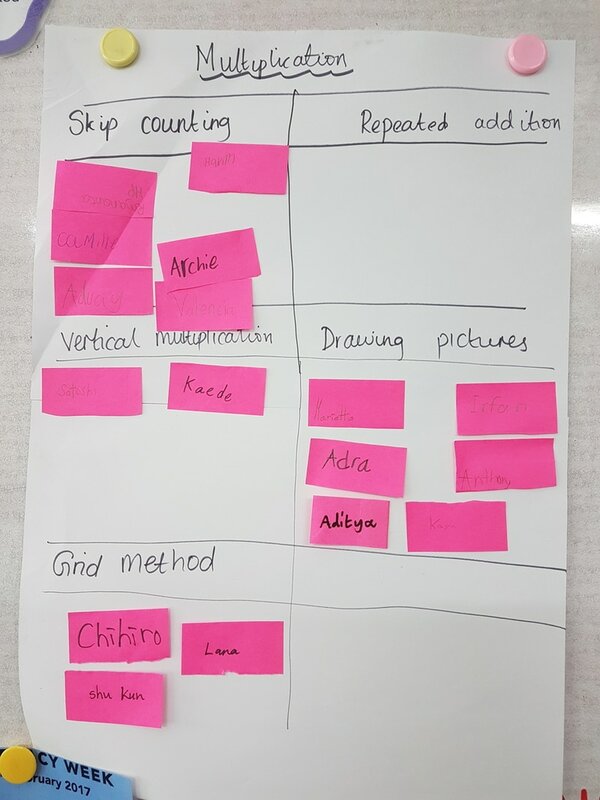 As a class, we collated all of the methods we already know and chose the ones we prefer to use. Once we had thought about our strongest method, we then chose a method we wanted to learn. As you can see we most of us ended up choosing either the grid method or long multiplication. 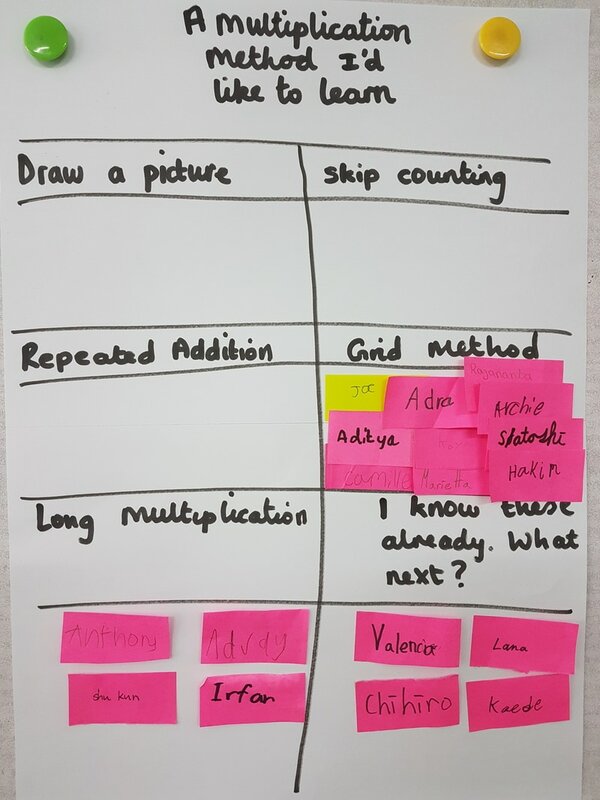 Over the past few days we've been using different resources to teach ourselves the method we chose. Some of us originally chose long multiplication but found it a little tricky so we decided to try the grid method first. Some of us already knew all of those methods so you may be wondering what we've been doing. Well, we've been busy proving to Miss Amin that we do know them all! Next week we'll be making videos to teach other people our method! This will show how much we understand of our chosen strategy. So watch this space. This week we did research on inventions like the light bulb,steam train and spinning jenny. Me and my group did research on the light bulb. We used books and laptops to research on our item. Kaya and Adra did 3 questions and me and Camille did 3 questions too. We researched the light bulb through our key concepts change and perspective. Today we shared our ideas with G3.2 so we could magpie there information and they could magpie ours. It's been a great first week back after the holidays. The children have gotten back into the swing of early starts and school very quickly and it's been great to see them all! This week we spent some time recapping on some maths areas that we covered last term such as reading timetables, time and using money. We've also been recapping on adding and subtracting. We had an exciting visit from the Grade 11 music students who came down to share their instruments with us. They taught us all about how their instruments worked and some of us even got to have a go at playing some! In preparation for our new unit, we've been reading The Lorax. We created story maps to help us retell the story and had a lot of fun doing so! 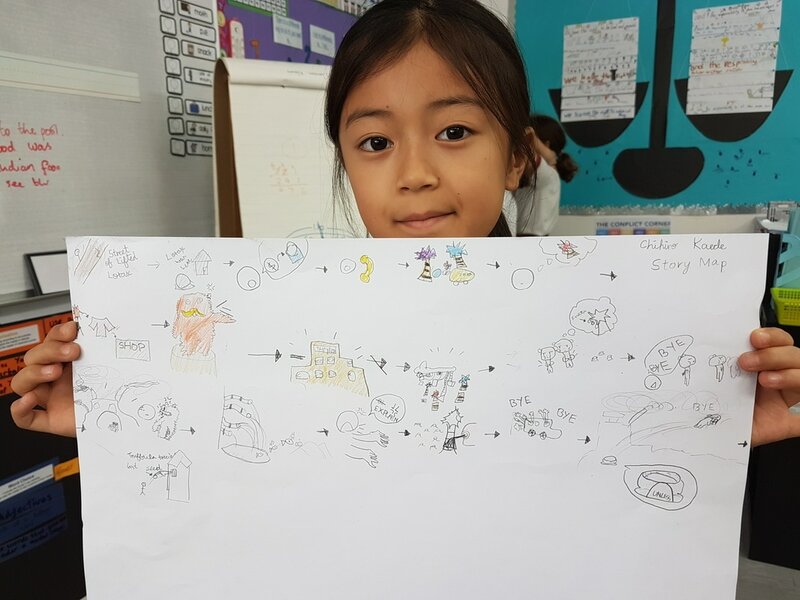 It's the first time we've had a go at story maps together and the children were very enthusiastic and eager to do them. We also role - played and led the Once-ler down a conscience alley to help him make the right choice...at the end though, just like in the book, our class Once-ler decided more money was the way forward! Over the last couple of weeks we have continued our learning of shapes by investigating area and perimeter. We thought about area through the concept of space and have had a lot of fun investigating various things! ﻿How do you express yourself? 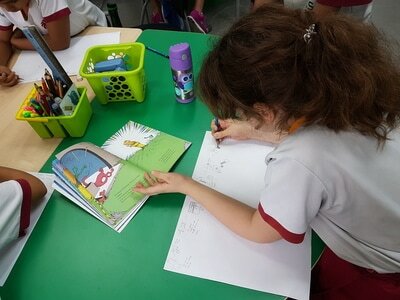 Over the last 6 weeks, Grade 3 have been looking at 'The tools we use affect how we express our ideas'. The children have worked very hard at looking at different tools through the concepts; perspective, change and reflection. 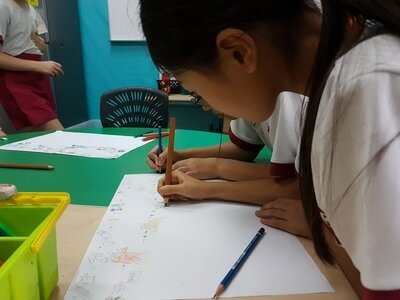 They have already posted some of the music they created to represent the idea of water in a previous blog post. Most recently, they have spent time selecting a tool, using the key concepts to form the research questions for their tool, carrying out the research, presenting this in the form of an information report and presenting their work to Grade 3.2. Have they been busy or have they been busy?! This project has probably been the longest one they've worked on so far this year and they showed nothing but stamina, dedication and enthusiasm for their research, with some children even continuing their work at home! They have learnt from each other, picked up new, technical vocabulary and shown how knowledgable they have become by presenting what they have learnt. Welcome to our blog. 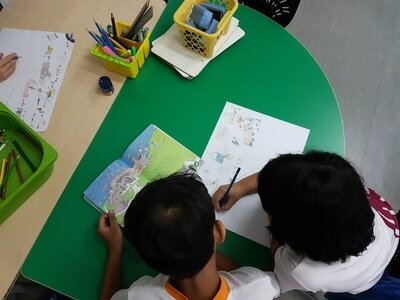 We are a group of 8 and 9 year olds who reside in Singapore. Follow us as we journey through the IB together.